A hidden gem popular with local skiers, the beautiful village of Valloire nestles at the foot of the Col du Galibier and Col du Télégraphe mountain passes in the Maurienne Valley in the French Alps. This resort brings together picturesque seventeenth-century architecture with well-equipped skiing facilities and makes a perfect destination for skiers and anyone seeking an authentic, French mountain village atmosphere. It is one of the quieter, lesser-known places to ski and is ideal for families or anyone wanting to find a special spot off the beaten track. Buying a property in Valloire offers a whole range of possibilities, with apartments and chalets available with opportunities for rental and permanent homes. 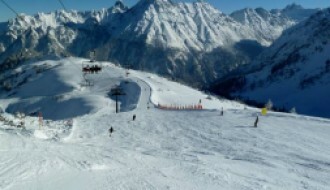 Valloire has broad appeal and a variety of accommodation to suit any budget, whether you are intending to rent out your investment or settle in this charming, well-appointed destination. 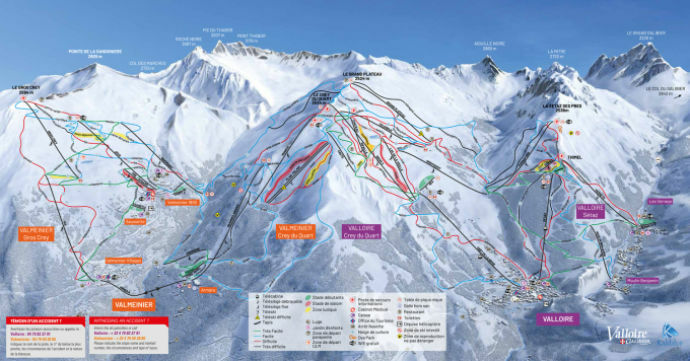 Valloire links up with Valmeinier to form the Galibier-Thabore ski area. With elevations between 1,430 and 2,590 metres, the resort offers an abundance of opportunities for the novice to the seasoned skier. 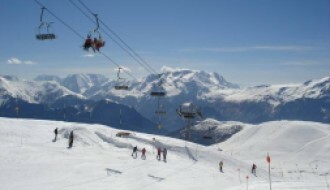 Skiers are provided with 35 ski lifts and 75 pistes, making this a user-friendly and appealing resort. Around 70 km of these are classed as easy, with 60 km ‘intermediate’ slopes, perfect for the more adept skier. Added to this are 10 km of ‘expert’ slopes for the most daring skier, as well as a snow park and night skiing on floodlit slopes. A terrain park and a half-pipe are also available for snowboarders. You will find skiing on the lower slopes a delight, with runs bordered with mixed woodland leading down to the village itself. Getting about is easy, as a free train service will take you around the main streets of the village by day, providing a link to the ski lift terminals and residential areas. For those who can’t get enough of the outdoor life, try dog-sledging, snowmobiling, or, for the true adrenaline junkie, paragliding off the resort’s high ridges. To wind down after one of the many activities on offer, try the local sauna, steam room or Jacuzzi for some special ‘me time’. Whether you are attracted to Valloire for the skiing or for the authentic mountain village atmosphere, you will be sure to enjoy the peaceful atmosphere, stunning views and range of local leisure and cultural opportunities. A seventeenth-century Baroque church sits at the centre of the village, and you can enjoy taking in the atmosphere of the narrow streets. Foodies will find a great selection of traditional restaurants, including crêperies, as well as a number of bars and clubs, some offering live music. Enjoy the farmers’ market held on a Friday evening, and sample the locally-brewed beer with glacier water for a taste of authenticity. Take advantage of the amenities such as the bowling alley, cinema and ice skating rink, and if you’re feeling creative, why not enter the yearly snow sculpture competition held towards the end of January, or simply admire the stunning creations? You can also explore the surrounding hamlets and villages (Les Granges, Les Clots, Les Verneys) which are connected to Valloire by a free shuttle bus, or one of the many dairy farms scattered around the area, some of which offer tours to see how their delicacies are made. Valloire has great potential for those considering purchasing accommodation here, from spacious mountainside chalets to practical apartments, many within extremely easy reach of the slopes and local amenities. Investment is ongoing to update the lift infrastructure, and the recent removal of the old multi-storey car park has enhanced the aesthetic appeal of the area. There are also plans for a new high speed chairlift being drafted for the start of the 2019/2020 season, that will provide new and improved links across the pistes. The latest snow report for Valloire shows snowfall per week averaging around 30 cm throughout the season with an average depth of 87 cm, making great skiing conditions. A typical weather report for the ski season will tell you that the resort enjoys crisp, clear and sunny conditions with great visibility and little wind. This is perfect for skiers and sightseers alike. 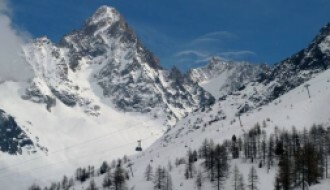 For updated snow and weather reports, take a look at our Valloire resort guide here. Getting to Valloire is hassle-free. Fly to the nearest airport at Chambéry with a one-hour 25-minute transfer by car, or touch down at Grenoble, one hour and 45 minutes away by road. You can also reach the resort by train, taking the TGV from Paris to St Michel de Maurienne, a scenic journey that will take you approximately five hours. From St Michel, you can take a taxi for the last leg of your journey, a mere 7 km. If you’re driving to Valloire, the main road to the resort is the D902, also known as the ‘Routes des Grandes Alpes’, taking in some stunning scenery along the way. A perfect destination for those seeking snow and scenery, the resort of Valloire has broad appeal to families, tourists and investors alike.